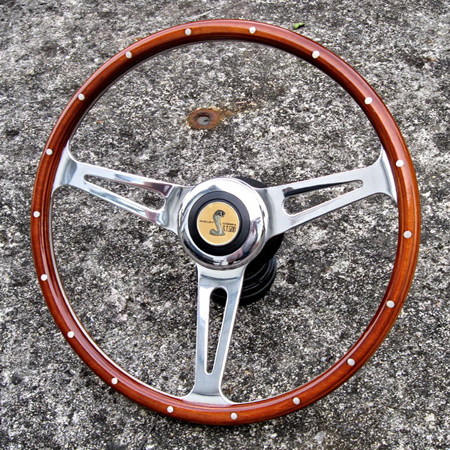 This Is The Best Vintage Steering Wheel Ever Made! 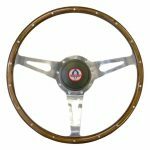 It’s been some four years since we last shared information about the wonderful European made steering wheels we managed to track down coming out of France. 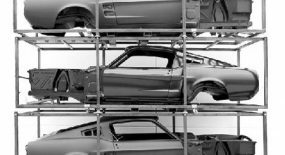 For those uninitiated after the Gone In 60 Seconds movie remake became popular there was a rush to build ‘Eleanor’ clones that were movie correct. 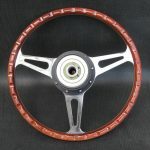 Unfortunately shortly after the movie finished the steering wheel factory that made these wheels changed it’s base of operation from France to the US and as a result a drop in quality was noticed. 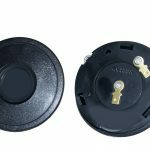 Here’s our initial comparison and here’s our follow up. 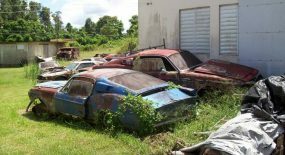 After a lot of searching we managed to track down a French operation creating these original wheels and they are of supreme quality and workmanship. 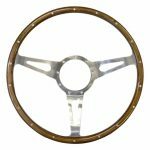 Our contact, Dom, not only produces these ‘movie correct’ steering wheels for early Mustangs but he also produces period wheels for all kinds of vintage automobiles. 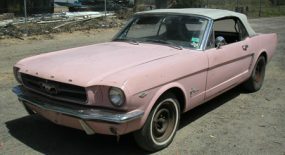 Through the wonders of the internet we can now see and purchase any of Dom’s wheels right HERE! 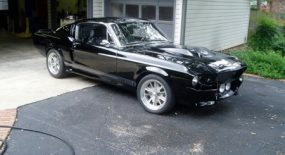 And the rest of his range HERE. Thank us later. 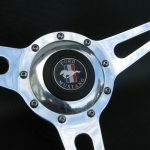 You may remember a few years ago we made everyone aware of the wheels our friend Dom was producing in France. 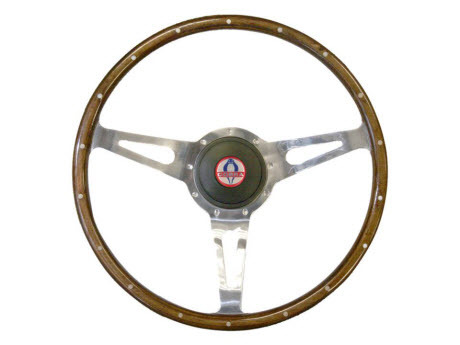 The wheels were, and still are, more superior to the US made Lecarra steering wheels of the same likeness and if you’ve ever held both in your hand, like we have, you will agree unreservedly. We won’t go into to much detail around the quality comparrison of both. You can read the initial post HERE and follow ups HERE and HERE. Though it now seems Scott Drake has jumped in on the steering wheels as well. 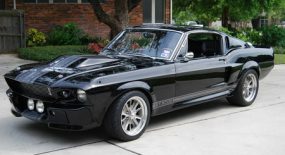 Well they’ve always carried Cobra and Shelby style wheels but now they have a new version which appears to be the same 18-rivvet style as Dom’s French made beauties. Scott Drakes premium Corso Feroce Steering Wheels you can be confident on any fierce course. 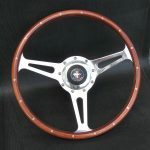 Handcrafted with pride, these beautiful 1965-73 Shelby Cobra Style Steering Wheels feature a 9 hole diameter with polished aluminum spokes and hand rubbed marine mahogany. 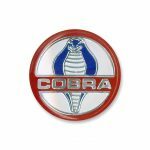 They are the perfect choice for that Classic Cobra, Mustang, or Shelby look Mustang enthusiasts crave. 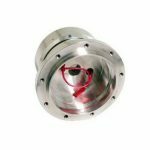 Stainless steel mounting screws and polished retaining ring are included for easy installation. 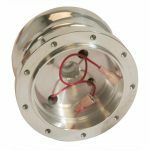 Word is still out on the quality of these but from experience It’s going to be very very tough to surpass the quality of the French made wheels. 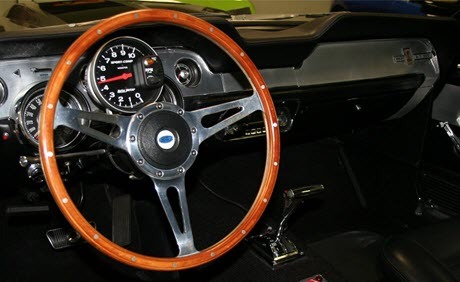 Check out Scott Drake’s Premium Corso Feroce 1965-73 Steering Wheels. 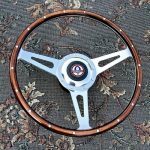 So since my post about the movie correct French steering wheel availability it seems Eleanor enthusiasts have bombarded my friend Dom proving there are many of you out there that are after one of these hard to find steering wheels. 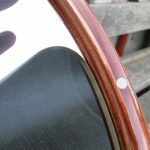 Well for those still deciding or considering one here is a small update from Dom, hit the jump for pictures of this beautiful wheel.